I’ll just come out and say it: The upcoming French elections are making me nervous. And I’m hardly alone: political analysts and ordinary observers around the world are watching anxiously as the Gallic electorate makes a historic and potentially world-altering choice, in voting rounds over two separate weekends (April 23rd and May 7th). The choice in question? At heart (and to admittedly oversimplify the political field quite a bit), it’s one between anti-immigrant ethnonationalism and creeping authoritarianism- the bizarre movement currently gaining worrying ground across the West– and one that will reaffirm France’s proud claim to be guided by Enlightenment principles of equality, liberty, brotherhood and democratic plurality. In addition to the prospect of France being governed by a candidate whose party has clear historic ties to 1930s, pro-Nazi fascism, and whose mean-spirited platform includes denying even urgent healthcare to illegal migrants, perhaps at greatest stake is the fate of Europe. The extreme-right and extreme-left candidates, Marine Le Pen and Jean-Luc Mélenchon, are threatening to pull France out of the European Union. But this isn’t a scenario that would affect France exclusively: following Britain’s Brexit and the rise of ethnonationalist and anti-EU parties across the Continent, it menaces the very integrity of the European project. The EU certainly has some egregious flaws, and needs an overhaul to render it more democratic; less wonkish and opaque and maddeningly bureaucratic. That said, it’s an institution that has, let us not forget, allowed for over 60 years of unprecedented peace, in the wake of two barbarous World Wars that cost millions of lives. Crypto-fascism or extreme-leftist anti-globalisation triggering the crumbling of the European Union, and its tendency to promote peace and cooperation between nations: this is the nightmare that’s keeping me up at night these days. Especially as someone who has benefited from the joys of holding a European passport, and living between two countries– one, Britain, that has decided to leave the Union– I have benefited from the European dream, and seen firsthand what it means in terms of mobility and opportunity. As much as I enjoy engaging in armchair punditry, this isn’t meant to be a political commentary site–and plenty of political journalists out there are offering in-depth analysis of the gaggle of candidates running this year, the implications and risks attached to their winning, and so on. I don’t have an expert’s perspective on these matters– so I’ll direct you their way if you’re interested. What is the point of my fretty musings, then? I myself am a relatively new French citizen, and the fate of my second, elected nation is one that now feels deeply personal. My upcoming vote this weekend is making me think about my long, often arduous path to getting a French passport– and the surreal, blissful moment of learning that I’d finally earned one. 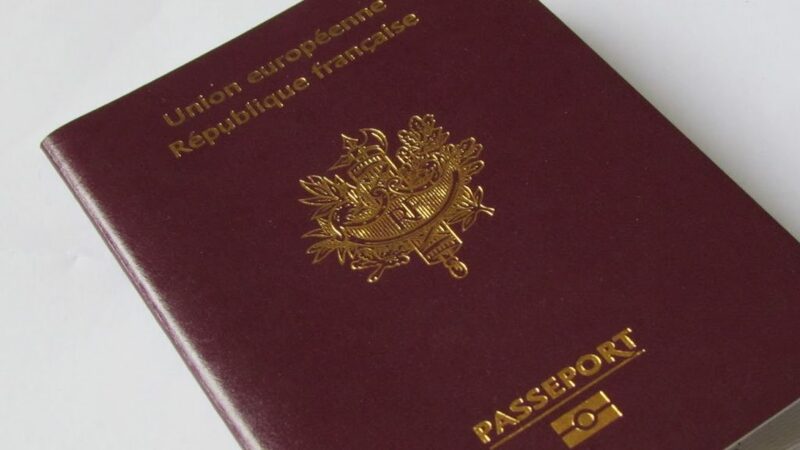 I only gained a French passport in 2010, after years of struggling to make it in Paris on student and temporary visas. I feel a weighty, deliberate and passionate sort of love for the country that naturalized me back in 2010: maybe one that’s roughly equivalent to the sort you feel for partners or friends. It’s one that seems distinctive: different from the less conscious, almost primal affection and loyalty you usually harbor for members of your non-chosen family (or, to belabour my awkward metaphor a bit further, your birth country). And just as most people don’t give up on their birth family for their adopted one, I’ve retained my American citizenship, remaining just as attached to the US. 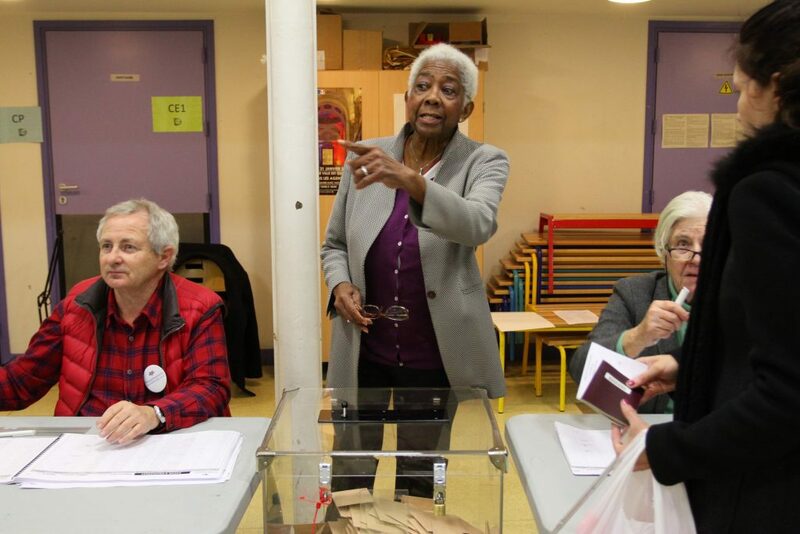 Earning the right to vote in a second country has even more significance for me since France only gave women the right to vote following the end of World War II, in 1945. 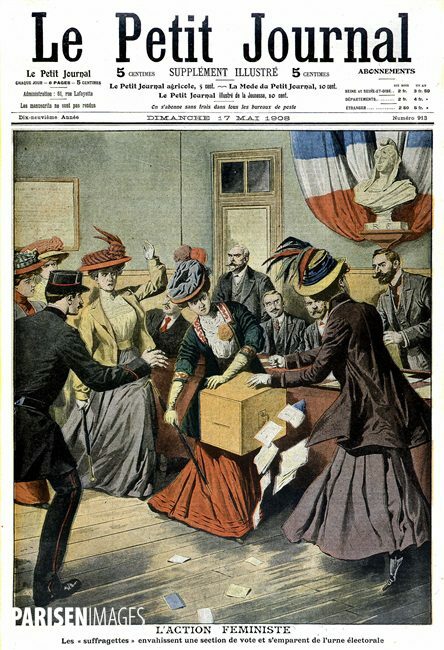 As someone who’s fascinated with the history of the women’s suffrage movements of the early 20th century, I think about the fights of generations of women who came before me every time I slip my little piece of paper into the box, marking my choice. It was in the summer of 2010 that I was finally made a French citizen, after living in Paris for nine years. I remember tearing up a little during the ceremony in Paris, surrounded by fellow compatriots of stunning diversity. Others in the room hailed from Africa and North America, the Middle East and Asia. 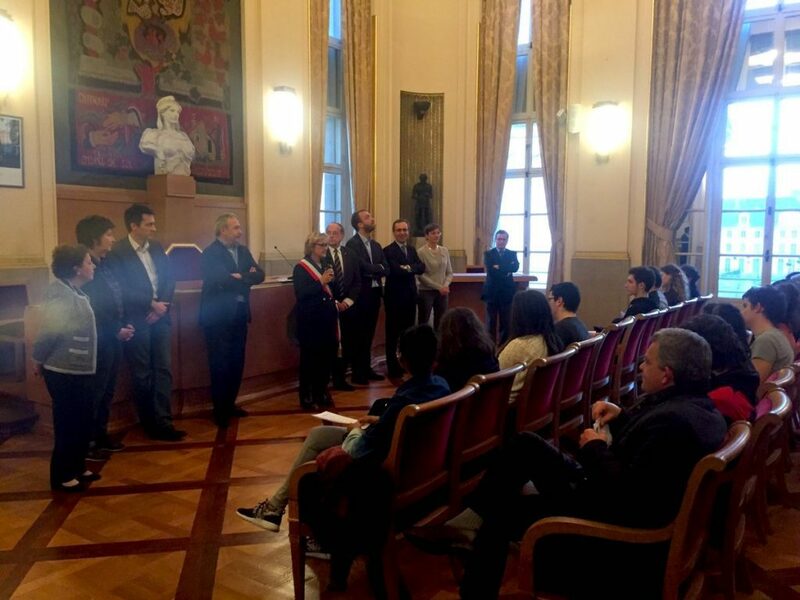 We sat and listened patiently as the Maire (mayor) of my arrondissement (local Parisian district) launched into a speech that, on any other day, I might have felt was hyperbolic, sentimental and slightly pompous. He welcomed us into the hallowed French fold, reminding us of the ideals of the Republic: liberty, equality, fraternity; he added that it was up to each of us to continue to uphold those values as new citizens. We sang the Marseillaise– the French national anthem, which I ordinarily find tiresome and rather vacuously patriotic– but today, it all had a different tenor. I was admittedly touched. The Maire also said something that has stuck with me ever since: that we, France’s newest citizens, had made an explicit choice to become French, and so our bonds with the country were special: ones of free will, rather than mere circumstance. As a result, he said in an increasingly rousing, bellowing voice, we were gatekeepers of what France might become in the future. Moreover, hailing from countries all over the world, we would bring to the country incredible diversity: cultural riches and contributions that would not have otherwise been present. He talked about how France, like the US (yes, he mentioned the US) is at heart a country whose rich cultural heritage is the result of hybridity, of waves of immigration and intermingling ideas, cultures, food, etc. 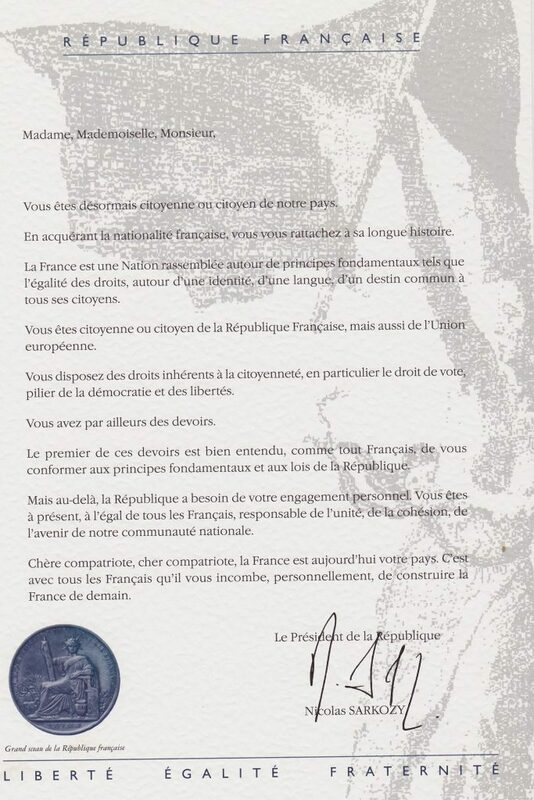 The letter I received from then-President Nicolas Sarkozy (someone I was never a fan of, incidentally) informing me of my newly acquired nationality. The letter states that I had also become a citizen of the European Union–a concept that is now under serious threat. Clearly, when France votes over the next two weekends, they will either be rejecting that principle and choosing to shut it down– or electing to hold it up and loudly reaffirm it. The official’s words at that ceremony, mildly hyperbolic as they may have seemed at the time, are now cemented in my mind. Especially in light of the deeply divisive and xenophobic mood that’s set in (even in Paris) in the wake of numerous terrorist attacks– most recently the murder of a police officer on the Champs-Elysées, I fear that French voters may set this value aside, choosing closure, fear and hatred of the “Other”. 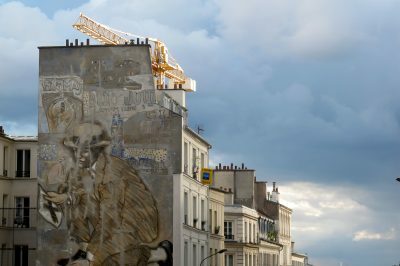 As I’ve already reminisced on at some length in this piece, my now well-established foothold in Paris began with a scrappy student existence living in a tiny “chambre de bonne”, followed by many years of financial and bureaucratic struggles that now seem distant and vaguely comical. They didn’t always strike me as funny, though. 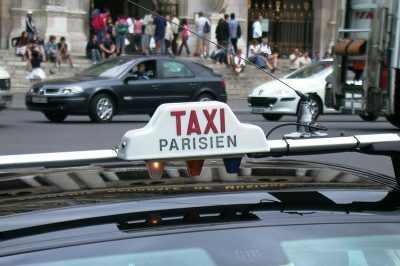 Year after year, I had to renew temporary visas, enduring agonizing visits in front of government officials at the place well-known by all legal immigrants in Paris: the dreaded Préfecture de Police at Cité. 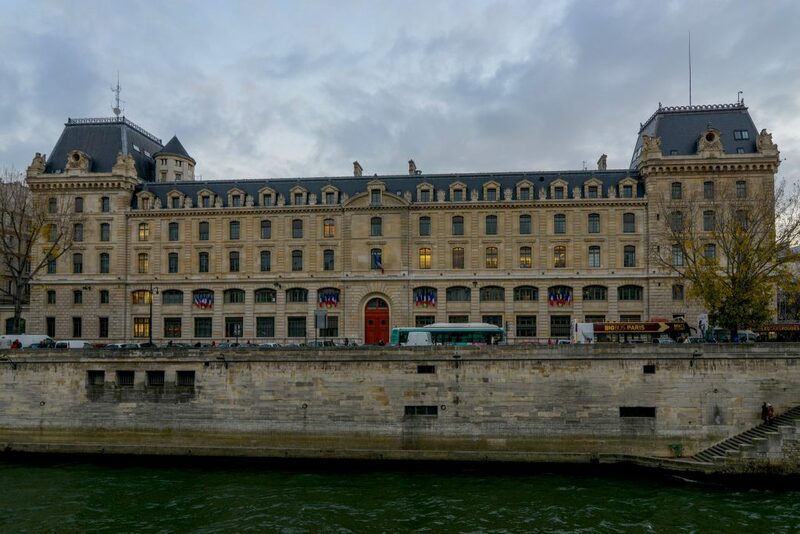 Located just a stone’s throw from Notre-Dame Cathedral on the stunning Ile de la Cité, the building looks pleasant enough– but ask any immigrant hoping to continue their dream of residing in the pays des Lumières, and they’ll tell you that the Préfecture fills them with trepidation. 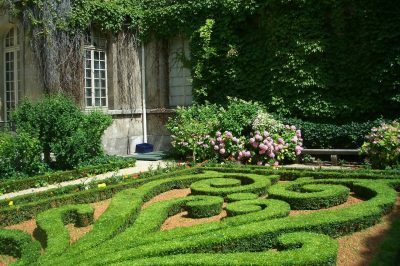 My quest to stay put in France, earn new degrees and establish my personal and professional life there was roughly as tiring as Sisyphus pushing a giant boulder up to the top of a mountain, only to have it immediately drop and have to repeat the process again. The first few years, I held “language assistant” visas that were only good for seven to nine months at a time. 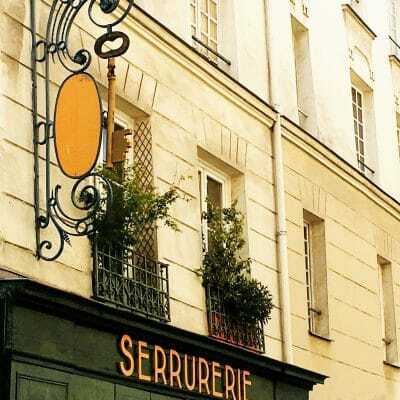 Securing a student visa offered some welcome relief– I enrolled at the Sorbonne to start a Master’s degree– but it only allowed me to work part-time, meaning my lean existence was pretty much guaranteed for years to come, until I finally gained a work visa and permanent residency rights. I’m not trying to suggest that things were terrible in those earliest years: I had a wonderful day-to-day life that didn’t require much money at all. 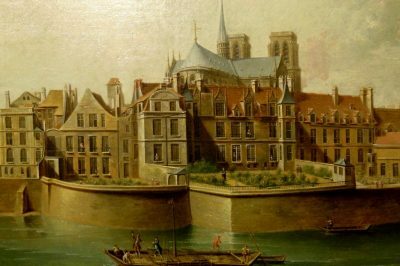 Exploring the city by foot became by far my favorite thing to do, owing to my lack of funds; it’s also likely what set me on my path to becoming a writer with expertise in Paris. I ate at cheap but decent restaurants, went to friends’ parties, and traveled whenever I could. My mother often remarked that my existence seemed charmed, and I wouldn’t dare dispute that. But the bureaucratic hoops I had to jump through, year after year, were equal parts terrifying and culturally instructive. Every summer or autumn, I lugged a bulging plastic file folder full of original documents and careful photocopies– electricity bills, student IDs, tax forms, work contracts, and tiny, unflattering pictures taken in metro station photo booths– to the pretty building shown above, and prayed to the visa gods for a friendly, unhardened bureaucrat to handle my case. Hours could pass in the grey, sunlight-deprived inner chambers of the Préfecture’s visa renewal office. When my number was finally, mercifully called, I would walk over to the official’s desk, hands trembling, and nervously present my documents. You can imagine the bitten-down nails that were forged in the weeks that preceded my finally getting the real deal back in hand. Something funny happened over years of having to endure these sorts of encounters, however– I learned to get really good at them, almost starting to view them as a familiar game that I was mastering. I started to get the sense that I had memorized to a tee what was expected of me in these visa-renewal situations– and I sort of embraced the challenge of getting through one of these anxious afternoons at the Prefecture entirely unscathed. As I’ve often admitted to my partner and friends, I took a strangely perverse joy in learning just what made the bureaucrats tick, and giving them exactly what they wanted. For example, in the early years, I’d bring in a pile of crumpled documents in no particular order, messily stuffed into binders, and frantically produce them when asked to, looking as terrified as if I were being sent to my execution. Acting like a rabbit about to be hunted inspired nothing but impatience and mild cruelty in many of the visa officials: they’d bark orders at me as I shuffled through my disheveled documents, looking for the wrong ones, and send me to the back of the line when I didn’t present my hallowed “dossier” just as they expected me to. With time, though, I figured something out: the bureaucrats loved a perfectly ordered dossier. I learned to assemble my files in a crisp and neat pile, corresponding exactly to the order specified on the list of requirements. I neatly labelled certain vague documents in meticulous handwriting in the upper right-hand corners. I made sure I wasn’t showing even a hint of a smile in my unflattering passport pics. I calmly responded to all requests for a certain document with a confident “Voilà: here is the original followed by the three photocopies”. And it generally worked like a charm. Instead of tisking with impatience and barking unforgiving orders my way, the officials would instead mutter “très bien“, “très bien” to themselves as they shuffled methodically through the organized stack of documents. They might even smile and wish me a good day. I had won French bureaucracy! I realize that bragging about this rings a tad pathetic. I had learned to be a perfect conformist! What an accomplishment! Weirder still is the fact that my cozy familiarity with French bureaucracy borders on disordered: I admittedly feel strangely calm and comforted filling out forms in the Gallic tongue– a fact that my partner enjoys mocking me for. Still, my persistence and desire to learn the ins and outs of a different culture ultimately gave me a new nationality– something I still beam about whenever I use my second passport. I didn’t earn it through a parent, or through circumstance. I earned it through years of hard work. You can call me a member of the cosmopolitan, globalist elite–and I probably am one, in truth– but I’m no diplomat’s daughter. This was a matter of choice, and a labor of love. With that in mind, I’m off to vote this weekend. It’s a question of solemn responsibility. And I’m wishing for France a future that doesn’t feel like a terrifying, slamming door against the democratic values it has claimed to cherish. I’m hoping not to lose the France I know, love, and am now a part of.